The most important findings of the excavations are 30 glazed bricks adorned with images of winged animals which incorporate the mythic beasts of the Elamite and Achemenid eras. Excavations have uncovered a great ancient gate in Persepolis in a region called Tale-Ajori, the head of an Iranian excavation group has said. Alireza Askari Chavardi said archeologists had been working to develop an insight into the functions of the ancient complex in Persepolis over the past century and to present a spatial analysis of coherence and conceptual links in the meaning of polis in the royal construction and the surrounding buildings. 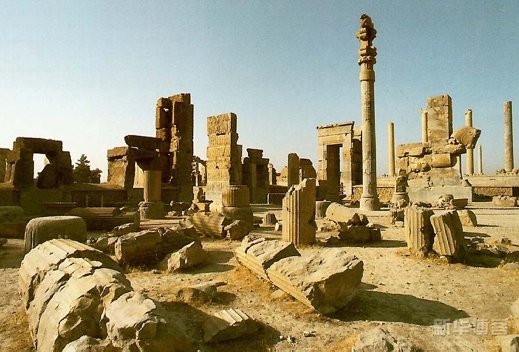 As for the excavations, he said, “One of the most important sections of the region which directly leads to Persepolis is the northwestern part of the royal seat, also known as Firouzi Complex, on which the studies by archeological expeditions have been focused. It is also the place where the relics of a famous monument called Tale-Ajori lie. A joint Iranian-Italian team of archeologists explored Tale-Ajori for nearly 50 days in October and November 2013. Persepolis was founded by Darius of Achemenid in 521 BC and was the dynasty’s seat up to the decline of the empire in 331 BC. The terrace where the royal houses were built envisages an urban landscape for Achemenid palaces with more than 100 ancient objects and great monumental works in the vicinity of the royal seat as well as the buildings scattered in an area of 600 hectares around Persepolis with gardens spread among these buildings. The excavations were led by Dr. Chavardi from Shiraz University and Professor Pierre Francesco Caglieri from Italy’s University of Bologna and financed by Fars provincial Department of the Cultural Heritage, Handicrafts and Tourism Organization. The season provided a reconstruction of the geomorphologic landscape of Persepolis and Parseh; 10 hectares of the areas near Tale-Ajori were documented through geo-electrical and geophysical instruments.